Category: Mediterranean Diet, Thessaloniki Recipe. Spread the sheet on the surface of your bench. Place inside the first track of the slice with a distance of 1-2 cm. From the corners so you can fold. Cut the sheet in parallel with a distance again 1-2 cm. From the lateral side relative to the side to be wrapped. With kitchen brush, brush the sheet with the white of the egg, the points you want to stick with the other side of the sheet as you wrap. Turn the piece of feta carefully wrapping the sheet to get around the double. Cut with a knife the sheet to release the wrapped piece. Search packet at the corners by folding them inwards, always using the brush with the egg white to stick the sheets together where necessary. Wrap each "packet" in cling film and place in the freezer for at least 1 hour. When the time comes to prepare fried, remove the packets of the slice from the freezer and remove the membranes. You start the process by putting the white sesame roasted in small pan without olive oil over medium heat. Then stir in a circular motion. Just start the sesame jumping (approx. 1 minute) remove sesame and keep for garnish. Add to pan extra virgin olive oil, let it raise temperature to medium heat (without starting to smoke, though) and add the packets of feta as from the freezer. The turning every 30" with a spatula or tongs on the other side and where you need it, at the end for a few seconds on the sides to get color. It will not take more than 3min. to color everywhere and the sheet to get a deep honey color. 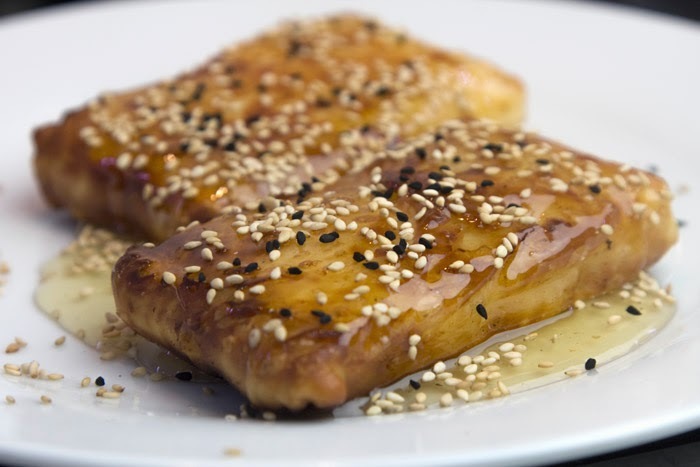 Allow the packets of the slice with leaf on the plate that will serve, pour over honey, spread if required and with a knife, sprinkle with sesame and black sesame and ready to serve.